BRADFORD’s newest cinema had its world premiere this week – and it is hoped the venue could help kick start the city centre’s evening economy. 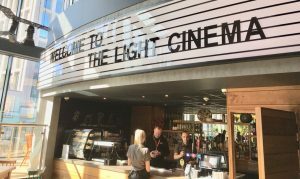 The Light Cinema is based in a newly built extension of The Broadway Shopping Centre, and includes six screens, all with luxury reclining seats. Patrons will also be able to order drinks, including ales from Saltaire Brewery, and food that they can take to their seats during screenings. In the coming weeks it will be screening blockbusters including Deadpool 2, Avengers: Infinity War, and Jurassic World: Fallen Kingdom. It will also show live streams of Operas, concerts and theatre productions. It is also able to offer flexibility programming for requests from local communities and societies and to support local film events and productions. This is The Light’s 10th cinema, and the company has another 10 under contract across the UK. 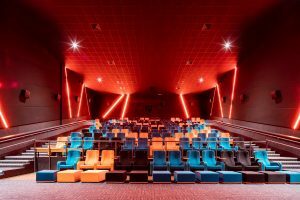 It is the third city centre cinema, joining Pictureville at the National Media Museumand Cineworld at Bradford Leisure Exchange. Still to open is a smaller screen, which will have an entrance on the other side of the building, near the former Veri Peri restaurant. Mr Pullinger said that screen would have about 20 seats and would be able for groups to hire. Ian Ward, General Manager of The Broadway, said: “One of the challenges is to drive the evening economy going forward. We’ve recently had more news about the former Odeon which means that is now going forward, and St George’s Hall will be re-opening soon, and you have Sunbridge Wells and City Park, so things are going in the right direction. On the ground floor level of the building there are a number of units that have planning permission for cafes, bars and restaurants. Currently there have been no official announcements, although Gourmet Burger Kitchen applied for an alcohol license for one unit in 2016, and Mexican food chain Tortilla has submitted a planning application for an extractor flue for another unit. For information about prices and listing, see here!